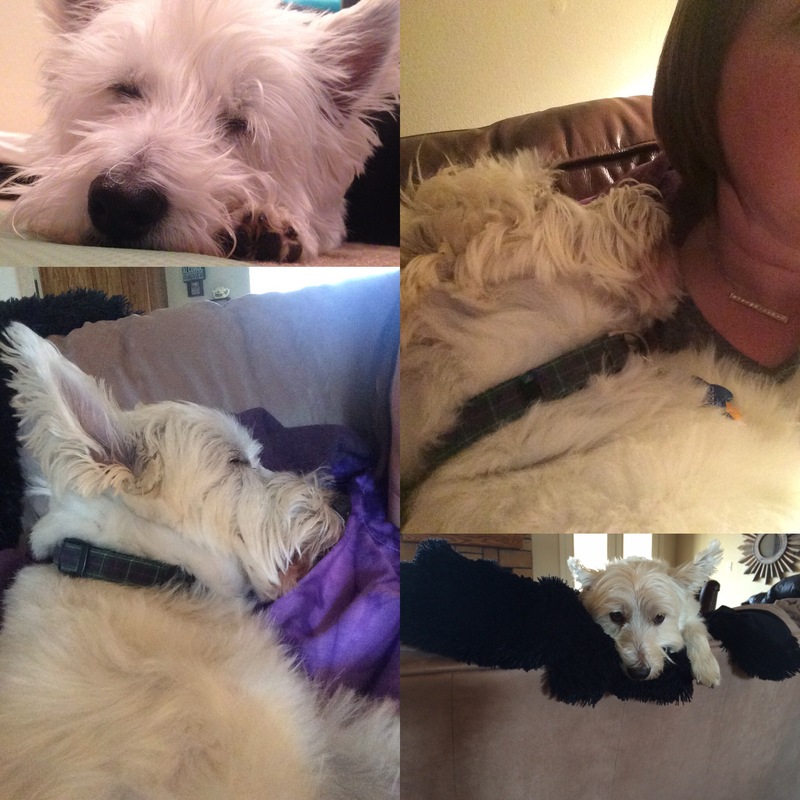 Jacques' Dog Blog | Because when it comes to Westies, you don't know Jacques! 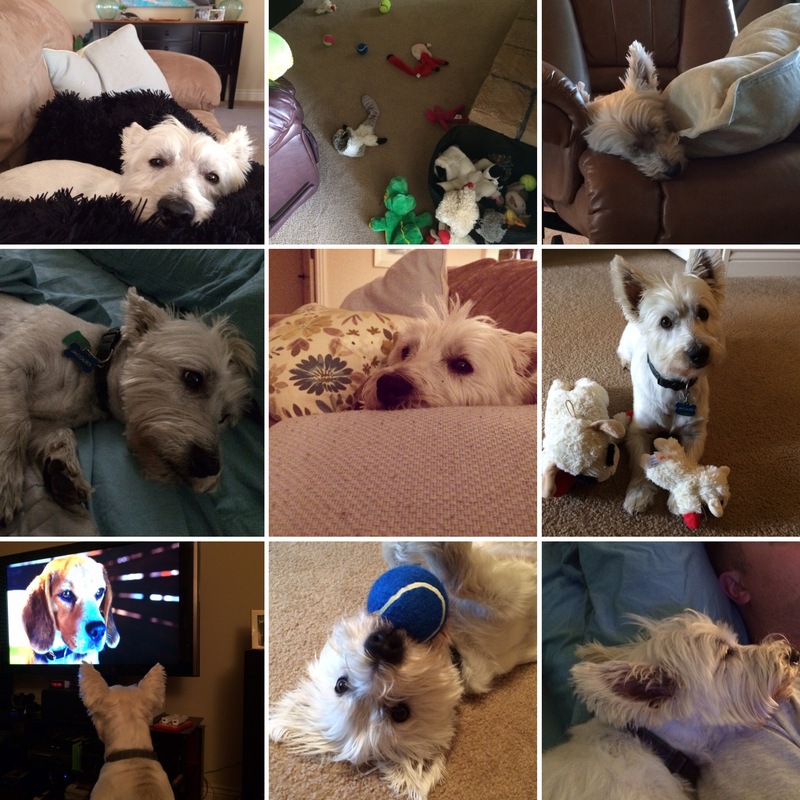 Because when it comes to Westies, you don't know Jacques! 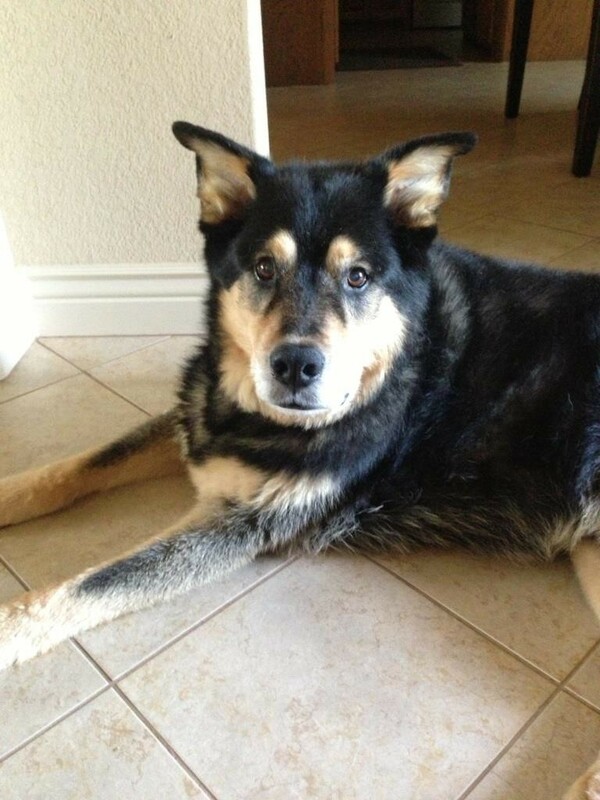 During the 17 years that I have been a doggie mom, I have asked, “What the…? ?” numerous times. Most of the time, I end up laughing and shaking my head. But one time in particular left me thinking that I had lost my mind. I was heading to the gym, but before I left, I put some frozen chicken breasts (four or five) in a glass casserole dish and set them on the counter to defrost. I slid the dish as far back on the counter as I could and chuckled while I did. I remember specifically thinking, “Rocky’s not going to bother this. He’s too old and it’s too far back on the counter.” (This was pre-Jacques.) With that, I went to the gym. When I returned home about two hours later, I was greeted with great fanfare (as usual) by Rocky. He escorted me through the kitchen barking and dancing the whole way. I got to the living room and stopped. Something was wrong. I looked back at the kitchen but didn’t notice anything out of place, so I continued through the living room to let Rocky out. I stopped again… I had this nagging feeling. Something wasn’t right. I went back to the kitchen, turned the light on and quickly looked around, but, again, nothing caught my attention. As I turned to leave, it dawned on me. The casserole dish had been moved. I walked over to inspect it. 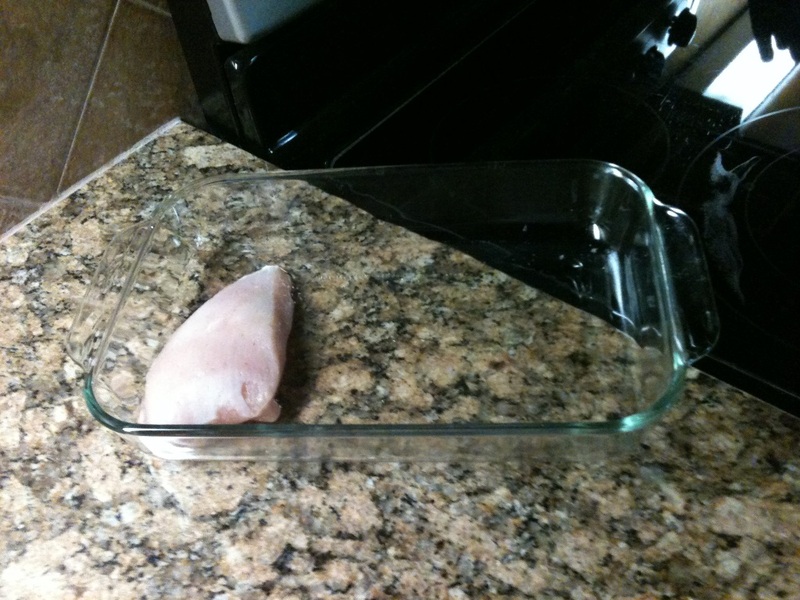 It was only moved a few inches… but there was now only one chicken breast in it. And there was no drips down the side of the cabinet; no liquid of any kind on the floor. There was no indication of what happened to that chicken. As I stood and looked at the crime scene, it was obvious who the culprit was, but I couldn’t figure out how he did it. I tried to imagine the scene and just couldn’t. For a few minutes I really felt like I was losing my mind. Surely I didn’t imagine putting out all that chicken? Why would I only set out one breast?? If Rocky ate them, how did he get them and a) not make a mess or b) not break the glass dish? Was it Ancient Aliens? Or was I just losing my mind?? The casserole dish was left flush with the back wall on a 2+ft. deep counter top. I still have no idea exactly how Rocky managed to get to the chicken, but it’s obvious that’s what happened. He, of course, played dumb when I asked him about it. (And don’t think eating all that chicken kept him from eating his dinner!) From then on, if something needed to be defrosted that day, I put it in the sink. I wasn’t taking any chances after that! Oh, Rocky… what the…??? “‘allo! This is Jacques. I had to commandeer my mommy’s computer because she is, in my opinion, slacking on the job. You see, she is supposed to be writing about ME. 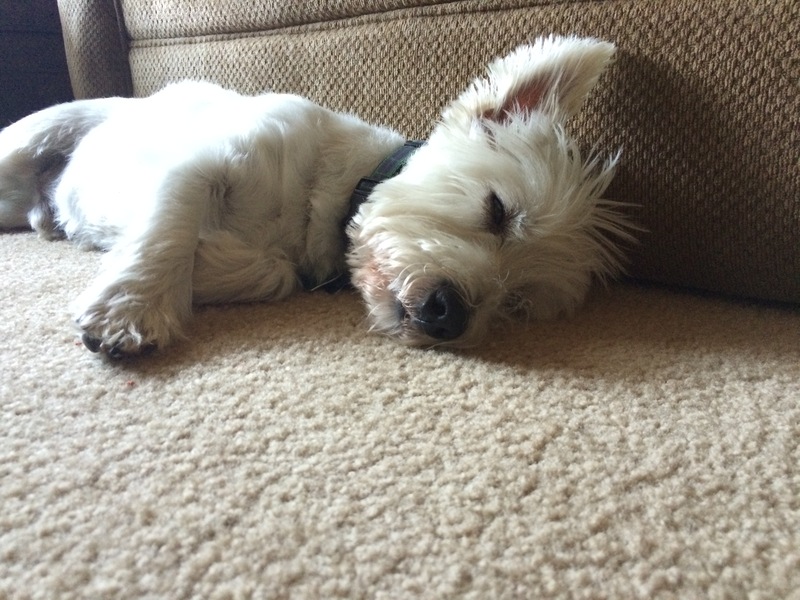 I do lots of interesting and amusing things daily like nap, bark at clouds, yodel when the UPS guy drives by, nap… oh. Yes. I already mentioned that. Well, she is not writing about me. No! Instead, I find her writing about volcanoes and plate tectonics for her class and googling torn tendons because she now has a stupid, ugly boot on her foot. (I do not understand how something on your foot can keep you from typing…) Occasionally I find her googling snorkeling spots in the Caribbean, but that I find acceptable. The rest – no! She should be writing about ME!! 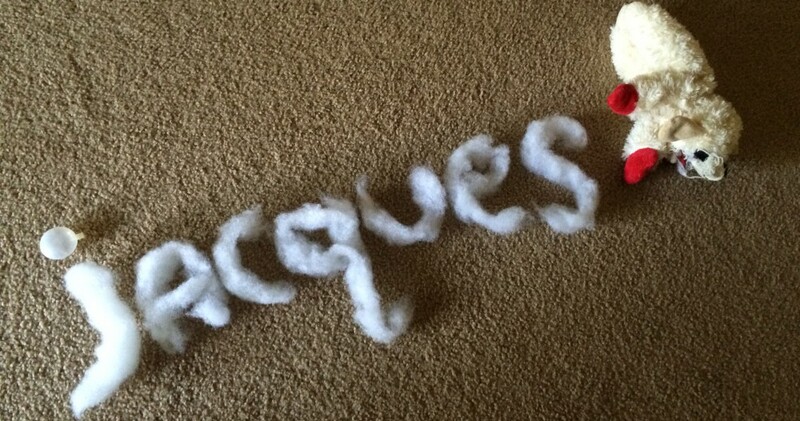 So, my dear blogosphere friends, I want to apologize for the lack of Jacques’ Dog Blog lately. It looks like in addition to manning, er, dogging my Instagram account, I shall have to dog my blog too! (At least until the semester is over and/or Mommy gets the stupid boot off her foot.) Ha-rumph! And, now… on to more important and impressive things. I want to send a special THANK YOU to my friend, Noodle, who nominated me for the Blogger Recognition Award!! Noodle, you and your mom are too kind! Thank you so much! I am humbled. Wait. I do not know if I am capable of that… I am humbled to the best of my abilities. Yes. There are, apparently, rules and so on that come along with this award. I do not do so well with rules, but I will give it a try. I am supposed to share how this blog got started… I think Mommy started this blog because she likes to laugh at me. No, no. It is okay. I know she likes to laugh at me and I, Jacques, will let her laugh. I am unconfidently confident in myself; her laughter does not bother me. In fact, I find myself trying to make her laugh because… well, it makes me happy. There. I said it. I, Jacques, love my mommy and like to make her laugh. So, I let her share it with you, my blogosphere friends. I am supposed to list a number of blogs who have impacted me and/or this blog. There are simply too many. When Mommy misses Rocky and shares it, so many of you offer kind words and loving stories. We have friends who share adventures from all over the globe. Friends who offer historical stories about Hawaii. Friends who share crazy/strange/fascinating stories about food and travels in Italy. Friends who share their wisdom and insight on life and getting older. Friends who are cats (shocking, no?) whose lives put any telenovela to shame. We even have friends who blog in haiku. I do not know what that is, but Mommy loves it. And, of course, we have our fantastic four-legged, furry friends. All of you make Mommy smile, laugh, and pause to think. I know I speak for Mommy when I say, ‘THANK YOU!! !’ to all of you! You are wonderful! Thank you again, Noodle, for this nomination. For our family, October is a special month. Sometime during this month, 15 years ago a puppy was born. This wasn’t just any puppy. It was a puppy that would forever change my life and live in my heart. I witnessed this little puppy get hit by a truck – not once, but TWICE. I watched in amazement as he got up and walked off. And as I rushed him to the vet, my heart melted as he climbed into my lap. This little guy was down, but he certainly wasn’t out – and that’s how he got the name Rocky. That would be the theme of his life. He was able to take the things life threw at him in stride, and while he would occasionally get down, he was a fighter… he was never out. He was the goofiest, most frustrating, most lovable, most “special” dog I ever met. 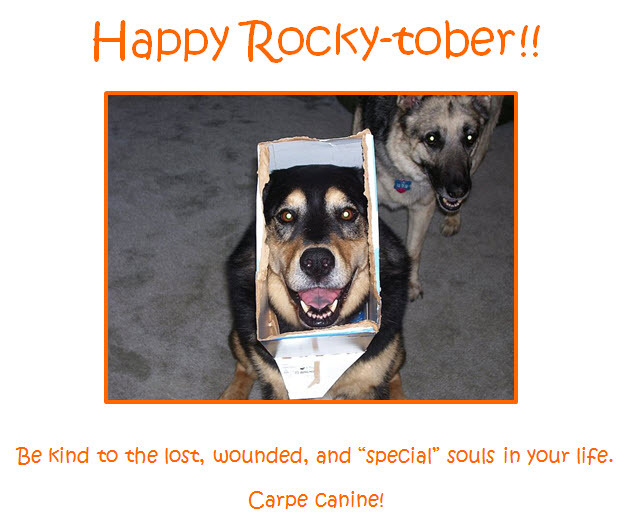 So, in honor of the “special”-ness that was Rocky, I would like to wish you a Happy Rocky-tober! Be kind to the lost, wounded, and special souls in your life. And always carpe canine! I am now an instructor at our local two-year college. Jacques hates how much time I have to spend working on lesson plans and lecture notes. He doesn’t like or understand that he can’t sit in my lap while I feverishly work on my next lesson. There’s a lot of grumbling and mumbling coming from the little pork chop as he voices his displeasure. In contrast, there’s a lot of giggling and border-line hysterical laughter coming from my husband, A3. Why is that? Well, amongst my school supplies, he’s found a new toy. This “toy” has turned a grown man into a giggling little boy who just can’t help himself. I’m not going to lie – it’s pretty hilarious. (I mean, it took my late German shepherd about 30 seconds to figure out that I was messing with him.) 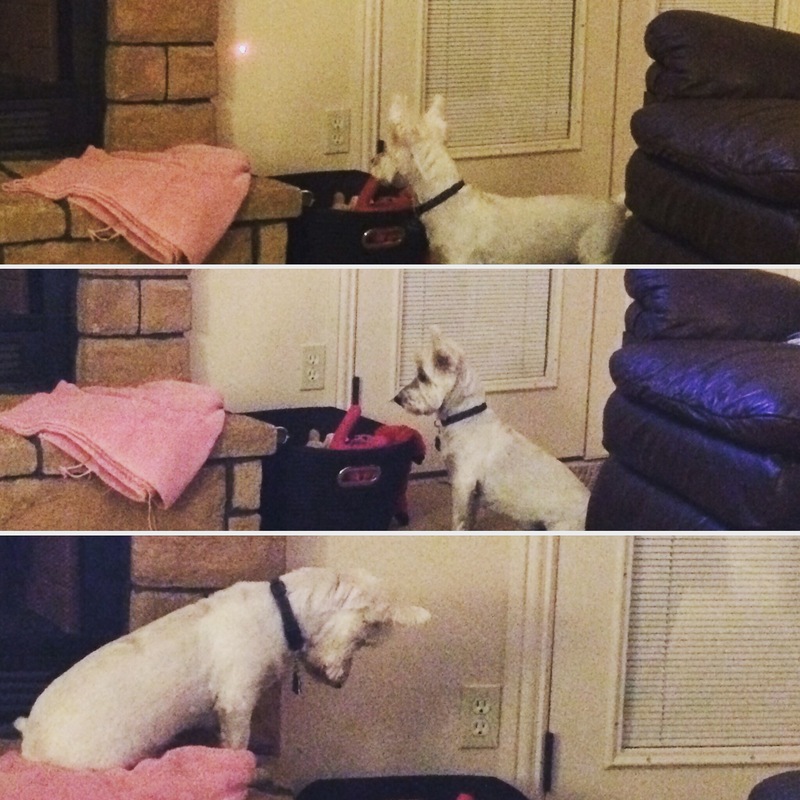 But I also feel a little bad for my totally neurotic, OCD Westie who will look for that light for close to an hour at a time. (I wish I was exaggerating, but I’m not.) Not even an offer of a treat or a snuggle will break his Westie focus. He. Must. Get. The. Light. A3’s argument is that it keeps Jacques occupied and keeps him out of my lap while I work. That is a true statement. I just worry about the potential “harm” it may do to his already insane-too-tightly-wound-neurotic-OCD brain. Things have been super crazy around here lately (much to Jacques’ dismay). So much so, that I didn’t realize it was a National Dog Day until the day was almost over. 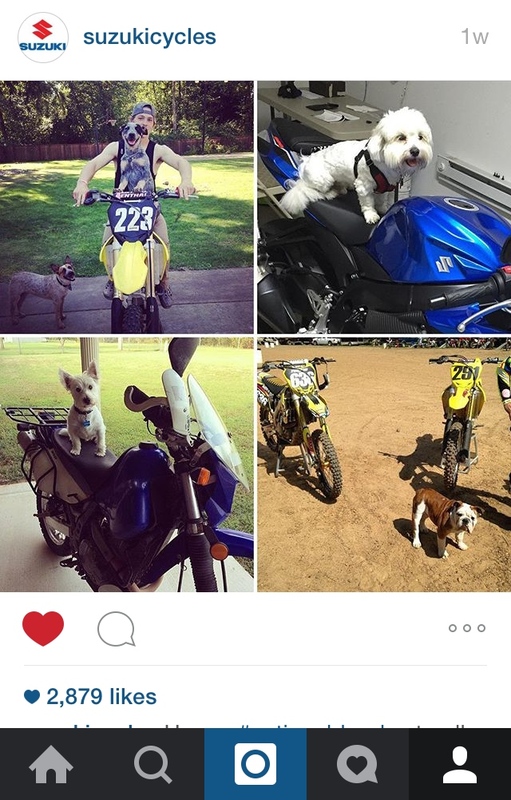 (gasp) As I hurriedly tried to get a celebratory post on Jacques’ Instagram feed, I received notification that Suzuki Cycles of North America had seen a picture of Jacques sitting on our Suzuki DR 650 and wanted to feature it (along with a couple of other photos) on Instagram in celebration of National Dog Day. Needless to say, we agreed to let them use the photo. We were thrilled! And Jacques’ ego was inflated even more – though I didn’t think that was possible. He feels that it is absolute validation of his superstar status… There has been no living with him since! 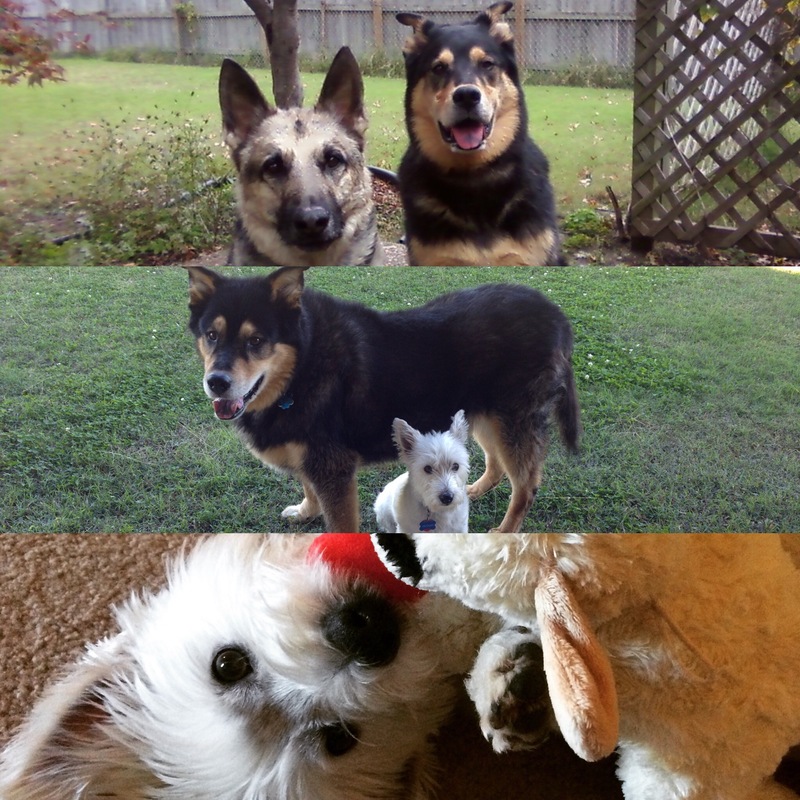 Our National Dog Day tribute to our boys… past and present. play, stop, play, stop, aargh! His life is not that bad – no matter how much he complains! Enter your email address to follow us and receive notification of new posts by email.